It’s really important to make sure the lighting symbols on your blueprints reflect what you want in your lighting plan. Also it’s critical that lighting matches up with the electrical outlets on your electrical plan. There's a checklist for you further down the page. There's a page on home lighting design if you're looking for lighting ideas for your home. 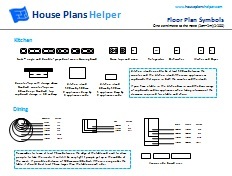 There's a free pdf available that has all the symbols used on House Plans Helper. Go ahead and sign up below to get your copy sent to your email box. I promise to use it only to send you your freebies and House Plans Helper Alerts.. This page is part of the blueprint symbols series. You may also be interested in the floor plan symbols page. Get your free blueprint symbols pdf which includes all the blueprint symbols in one file. Lighting symbols for fixtures are perhaps the least standardized in architecture offices. There has been so much change over the past few years as LED fixtures and halogens have been added to incandescent lighting. 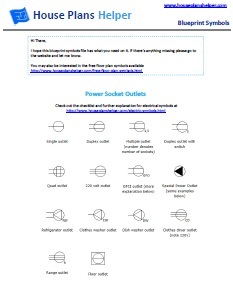 Symbols for switches are very standardized. Remember to check in the key of your blueprint plans. A tip for mobile browsers - these symbols are best viewed with your phone in landscape position. * For directional downlights the arrow indicates the direction of the beam. * Waterproof lights are required in some places in bathrooms and outside. Single pole switch - This is the most common type of switch. It allows a light to be turned on and off from a single location. Double pole switch -This is the same as the single pole switch in that it turns a light on and off from a single location but it has two 'hot' wires so it can handle 220v. Three way switch - It's not very intuitive but a three way switch allows a light to be turned on and off from two locations. So no prizes for figuring out that they need to be used in pairs. This is really useful for the top and bottom of the stairs. Four way switch - Used in between two three way switches to controlling a light from three locations. Pilot light switch - A switch with a little light that indicates that the circuit is on. Check that the correct type of light fixture is specified. Check that all the correct fixtures are on the correct circuits with the correct switches. For example you might want a switch for the central fixture at each end of the room, and a separate switch for the circuit that has the lamp outlets. Is the 3 way switch for the central fixture specified correctly. Check that the switches are in a sensible place – both the location in the room and the height on the wall. Check that dimmer switches are specified where you want them. Check that the switch panel design, or individual switch layout if grouped in one location are properly specified. Check that there are plug outlets (in the wall or floor) for any table or floor lamps you have planned.